Hello! I love pasta recipes so much and this Instant Pot version is delicious and filling comfort food that’s a must-try! It’s a dump-and-go recipe, which makes this recipe easy to prepare. The hardest part is waiting for the pasta to cook, but you let the Instant Pot do the work. 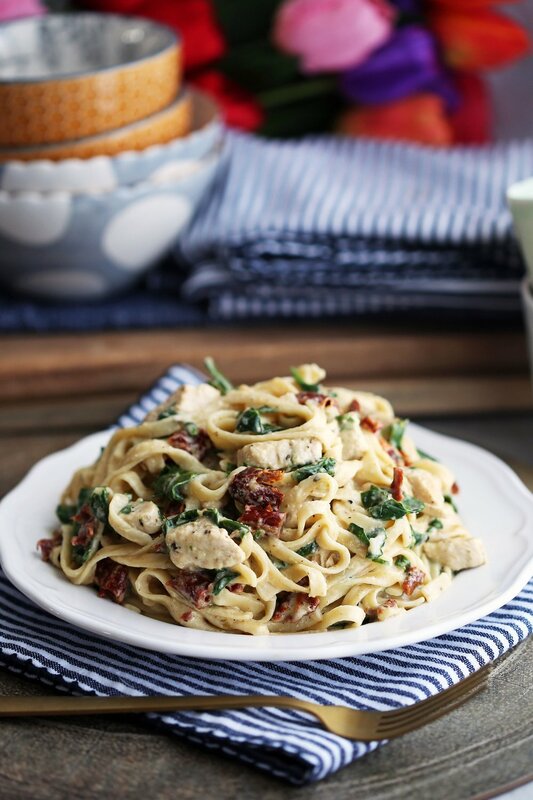 This dish uses fettuccine pasta (the long, ribbon-like pasta) and features a simple homemade cream-based sauce, protein-rich chicken breast, melted parmesan cheese (cheese and pasta are a perfect pairing), nutritious green baby spinach, and sweet-tart sun-dried tomatoes (I love the intense tomato flavour of them). 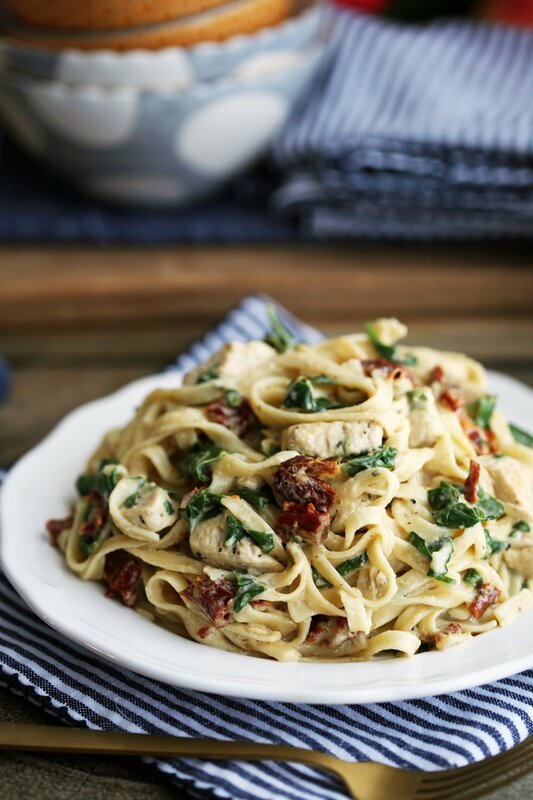 I hope you enjoy this recipe for Instant Pot Creamy Chicken Fettuccine! How do you make this Instant Pot pasta? Here are some helpful tips for making this pasta recipe. (Scroll down or click the “Jump to Recipe” button (it’s below the recipe title up above) for the complete ingredient amounts and full instructions in the recipe card). Follow the order of the ingredients added to the Instant Pot. This not only helps prevent the annoying “Burn” message from appearing on the Instant Pot, but also prevents the pasta from clumping up and sticking together. Stir in the chicken broth, chicken, and seasonings first. Then top with the pasta. Yep, you’ll have break the fettuccine in half so it fits in the Instant Pot. Scatter the pasta randomly on top of chicken and broth mixture. The pasta can overlap so it all fits. Check out the photo above to see what I mean. Most importantly, DO NOT stir the pasta with the rest of the ingredients. Then pour the heavy cream over the pasta. Gently press down the pasta so that it is touching the liquid. As the pasta cooks in the Instant Pot, it will absorb the chicken broth, which gives the noodles a richer savoury flavour than just using water. 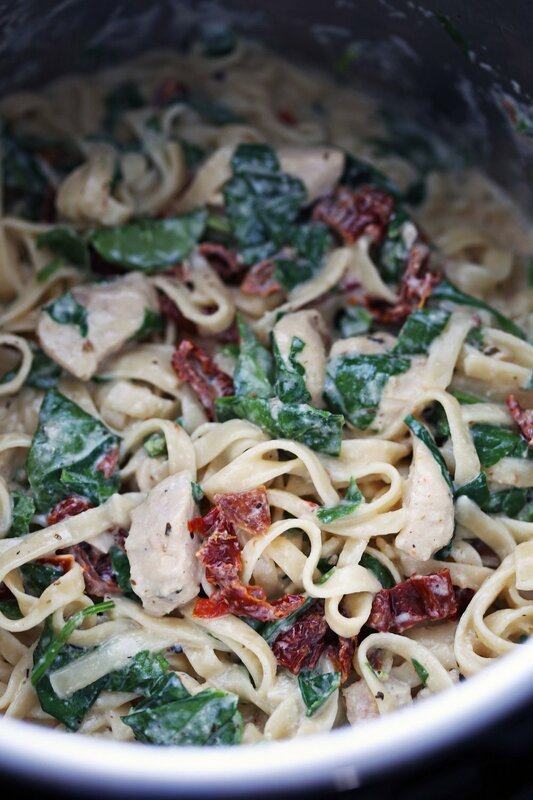 Measure out and coarsely chop the spinach and sun-dried tomatoes as the pasta cooks. Use freshly grated parmesan (I usually go for parmigiano reggiano) from a block (the hard-dry type). Pre-grated/shredded cheeses often have stabilizers, which can cause the cheese to not melt completely and clump up or remain stringy when mixed with hot foods. Once the pasta is ready, open up the Instant Pot and give the ingredients a gentle toss to incorporate everything together. Let it sit for a minute or so to let the sauce thicken up a little. Then stir in the cheese and add baby spinach and sun-dried tomatoes last. These ready-to-eat ingredients add great flavour and colour to this dish. The heat of the pasta will wilt the tender spinach and the sun-dried tomatoes (I use the ones that are in seasoned oil) are perfect in this pasta. Looking for more Instant Pot dinner recipes? Check out these ones. Is tasty comfort food: Pasta coated with tasty creamy sauce and tossed with spinach and sun-dried tomatoes is just so satisfyingly delicious. Made with simple ingredients: This recipe uses ingredients that are likely easy to find at your local supermarket. Is quick to make: It’s great to make for a fast weekday or lazy day meal. Makes four servings that's perfect to serve the family. Made in one-pot (Instant Pot that is) so cleanup is quick. I hope you try this easy pasta dish! If you make this recipe, please leave me a rating and comment down below or tag me on any of my social media. I’m @yay_for_food on Instagram. Please share your recipe pictures! Place the following ingredients in the Instant Pot: chicken broth, chicken, Italian seasoning, garlic powder, and salt and pepper. Stir to distribute ingredients, making sure the chicken is in a single layer. Then scatter the fettuccine on top of the other ingredients in a random fashion (in different directions, a little overlap is okay). DO NOT stir together. Pour the heavy cream over the top of the pasta. Press the pasta down slightly so that most of it touches the liquid (it’s okay if some of it sticks out). Seal the Instant Pot and cook at high pressure (“manual”/"pressure cook" function) for 5 minutes *(see first note). After it is ready, allow natural pressure release for 5 minutes before applying a quick pressure release to completely depressurize (until floating valve drops). Open the Instant Pot and give the ingredients a gentle toss to incorporate everything together. Let it sit for a minute to let the sauce thicken up a little. Stir in the parmesan cheese until the cheese fully melts. Add the spinach and sun-dried tomatoes, gently tossing until the spinach wilts. Taste for additional salt and pepper. Best served immediately. *It takes 10-15 minutes for the Instant Pot to come to pressure. Use parmesan cheese (I prefer Parmigiano Reggiano) from the block to ensure that it melts and creates a smooth texture. Using pre-grated/shredded parmesan cheese may result in a stringy sauce. Nutritional information represents one serving for a total of four servings.